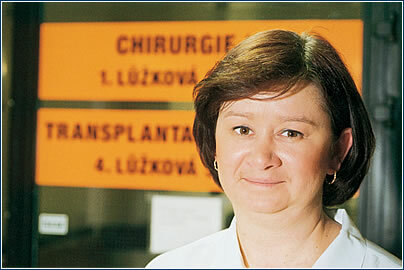 Eva Kučková, the right hand of well-known surgeon Pavel Pafko, is a “textbook” head nurse. She strikes a balance between the needs of patients, doctors, and other personnel, all the while strictly observing budgetary pressures. More than twenty years ago you started working as an ordinary nurse at Surgical Clinic III. You led a station, and you are now the head nurse. What is the difference between running a small team in one department and running the large team of an entire clinic? The size of the team is very important. It’s easy to run a ward with six nurses and one station head, because after some time a cohesive team that communicates well is formed. The larger the team, the more anonymous and the harder to run it becomes. Although I’m currently responsible for about 90 nurses, I try to stay in daily contact with the entire clinic, to make my rounds of all the wards every morning, and try to ascertain what’s new. I try to remember all the girls’ names and to speak with them directly. It’s paid off many times – when people know each other they react far better to unusual situations, and they’re more willing to help each other out. Is there any difference between running a purely female team and running a mixed team? Why are there so few male nurses in this country? I don’t see any big differences, there are just minor details. Men bring a better atmosphere to a team. They don’t make snide comments, they’d rather straighten things out among themselves; while sometimes female nurses get envious and jealous of each other. Unfortunately, we have only three male nurses here. True, they aren’t as conscientious about cleaning as female nurses are, but they’re irreplaceable where heavy physical work is required. And why do so few men enter this profession? I attribute it to the low pay nurses get. You could similarly ask why there’s only one male teacher for every ten female teachers. This is a type of work that can be done solely for love, not for money. That provides the general motivation. Do you have any influence over who is accepted, and what are your requirements for applicants? I have a completely free hand when choosing people, yet the criteria often depend on the situation. If I don’t have enough nurses I try to accept nearly anyone. In ideal conditions I choose girls who don’t wait to be assigned work, who take a more active approach. Together with the station nurses I’ve discovered that class valedictorians aren’t as good as average students when it comes to actual work, because the average students are generally more skillful and practical. So when I’m interviewing a nurse I ask her how she did in school, and this influences my decision. Professor Pafko, the clinic chief who became famous as a pioneer in lung transplants in the Czech Republic, is your direct superior. What is it like to be in the middle – the nurses’ supervisor and Pafko’s subordinate? Are there any conflicts or misunderstandings between you? Definitely not. Professor Pafko is a boss who is well aware that a doctor can’t exist without nurses. He knows that surgery is pure teamwork and that no individual can accomplish anything without the support of the others. So he places great emphasis on mutual communication. He’s open to discussions, and I can turn to him about anything. That’s because we’re united in a common goal – satisfied patients and personnel. In 1997 Professor Pafko’s team started doing lung transplants. Could you tell us how such transplants are coordinated? A transplant operation, in which at least twenty people take part, has to be done very quickly, because the removed organ must be used within a few hours. During its transport the operating room is being readied and the transplant team is being assembled. The moment the organ arrives the patient must be ready for surgery; this means that both the patient and the doctors must be reachable by mobile phone anywhere, at any time. Coordination is very demanding on the psyche, and if someone can’t handle the situation we have problems. Fortunately we’ve always been able to coordinate the procedure, and we are subjected to less and less stress. At the end the feelings of joy and satisfaction rule, when we see that we’ve been able to restore someone to life. 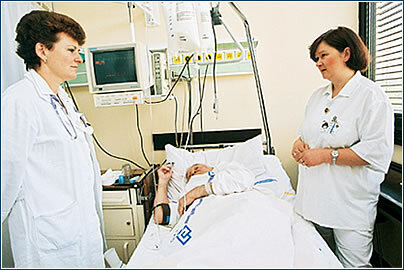 A doctor usually spends a few minutes with a patient when he makes his rounds, while a nurse stays in constant contact. Is it possible to prevent sensitive emotional ties between personnel and patients? Although we organize lectures on this theme to help nurses handle crisis situations, I can’t deny that strong emotional pressures pose problems. I knew the first transplant patients personally, and I didn’t resist forming emotional ties with them. Unfortunately, some of them have already died, and this has been very hard on the nurses. It took them a long time to get over these deaths. Now they know that they should be nice to patients, but should keep a professional distance from them. Do you know about any of your managerial weaknesses? Sometimes I make a decision that I later regret, and I see this as a weakness. I think that if a person makes his maximal effort he can never be 100% fair. I would like to find the strength in myself to praise people who work well and to call people who perform poorly to task, and to stand by my position and not hesitate. In addition I try not to bring my personal problems to work. I don’t want anyone to suffer because I’m tired or stressed out. What is the hardest part of managing your personnel? It’s definitely the ongoing search for balance between providing appropriate patient care and the nurses’ needs. In short, it’s about money. If we had more of it we’d have enough nurses. The way it is now, we’re always looking for ways to save, and we can’t afford to hire even one more person. You’re currently studying for your bachelor’s degree in nursing at the medical school. Why is ongoing education so important to you? I want to be able to answer my nurses’ questions concerning patient treatment, or at least to know where to find the information. It’s clear – a person who leads others should be well versed.